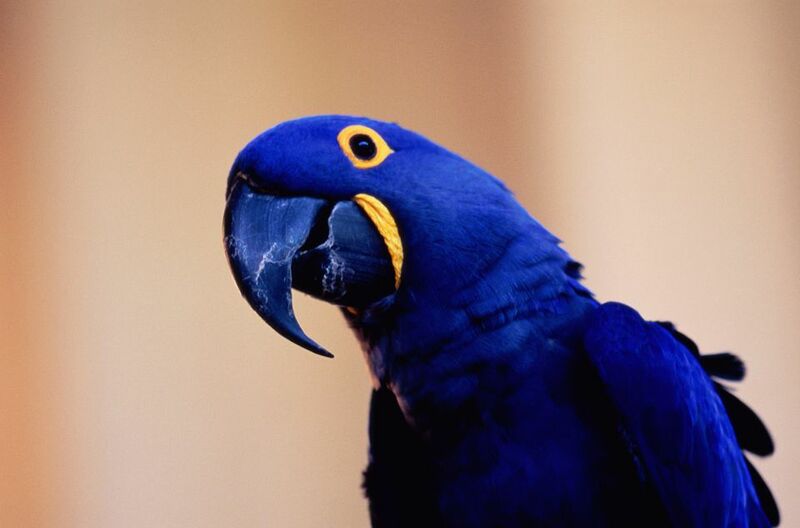 The beautiful, cobalt-blue hyacinth macaw is the largest of all parrots. It is a rare and threatened species that should be kept only by a very dedicated owner who can provide for needs that are as large as the bird itself. This is a bird that is more common in zoos than it is in private homes—and for good reason. It is a rare owner who has the time, patience, and financial resources to care for a unique and sensitive bird that is nearly as large as a bald eagle. The hyacinth macaw is also sometimes known as a blue parrot. The hyacinth macaw is native to central and eastern South America. There are three main populations: one in the Pantanal wetland region of Brazil, eastern Bolivia, and northeastern Paraguay; another in the Cerrado region of Brazil's eastern interior; and one in the Amazon basin of Brazil. The hyacinth macaw prefers to dwell in palm swamps, woodlands, and semi-open areas, and usually avoids dense, humid forests. It can usually be found in the open areas along major rivers. English ornithologist and artist John Latham first described and cataloged the hyacinth macaw in 1790, and its numbers in the wild have been in steady decline since then, due to a gradual reduction in habitat and steady demand for the bird in the pet trade and by indigenous tribes who hunt the birds for meat and for their ornamental feathers. As a result, the hyacinth macaw is listed in Appendix I of the Convention in International Trade of Endangered Species list, which prohibits international trade of parrot species. Both Brazil and Paraguay now protect the bird by law. This largest of all parrots can measure as long as 40 inches from the beak to the tip of the tail, with a wingspan as large as 4 feet. Adults weigh in at 2.6 to 3.7 pounds. A hyacinth macaw that is well cared for in captivity can live more than 60 years. Diet is especially important in achieving this lifespan. Though somewhat frightening in appearance due to its enormous size and powerful, sharp hooked beak, the hyacinth macaw is something of a gentle giant. Hyacinths are quite gentle by nature. They are easily trained by positive reinforcement and tend to bond strongly with their human caregivers. Hyacinth macaws have a wide variety of vocalizations, ranging from deep guttural growls and loud screeching to high trills. They are also capable of purring. They tend to make more noise when they form a large flock. Hyacinth Macaws are a deep shade of solid blue, with bright yellow patches around the eyes and beak. Hyacinth macaw's are a handful to care for, so before seeking a breeder, check with animal rescue organizations and adoption agencies on the chance that a bird may have been given up by someone unable to care for it. Beyond this, macaws are not commonly sold in pet stores, so seek out a breeder specializing in this specimen. These birds demand more time and attention than other species, so hyacinth macaws are definitely not the right pets for just anybody. Large, beautiful, and intelligent, they can be quite alluring, but resist the temptation to bring a hyacinth home without thoroughly thinking it through. Caring for this bird is an enormous undertaking that demands a long time commitment. As might be expected with such a large bird, a hyacinth macaw requires a spacious area to live. There are very few commercial cages large enough for this bird, and almost none that the bird cannot break out of. Many owners find that a custom-designed cage is necessary, although a full room dedicated to the parrot is even better. This bird needs space to fly about—even if it has had its wing feathers trimmed. Most regular cages can easily be turned to rubble by the powerful beak. If you must keep the bird in a cage, the best bet is a cage made of stainless steel. Stainless steel cages are far more durable and long-lasting and the benefits of owning one for years outweigh the cost in the long run. A stainless steel cage is a worthwhile investment. Hyacinth macaws can be very destructive, and it is critical that the cage have lots of wooden toys and branches to chew on. You should expect to replace these frequently. A hyacinth macaw's beak is a powerful tool, which means that they must be taught at an early age not to "mouth" their human caregivers, no matter how gently. Thankfully, they are usually quite docile and easygoing and seem to enjoy learning and human companionship. Like virtually all parrots, the hyacinth macaw is a highly social animal that requires a lot of interaction with its human caregiver in order to be emotionally happy. Neglected, confined birds are often described as "neurotic," given to screaming, destructiveness, and self-mutilating behaviors such as feather-plucking. If they receive plenty of attention, though, they will prove to be among the friendliest of the macaw species, exceedingly interested in humans. Although not the most fluent talkers of the macaws, a hyacinth can learn a few words and phrases, which it will repeat incessantly. They are highly intelligent, and may even learn to use those words in proper context. In the wild, hyacinth macaws primarily feed on fruit, green vegetation, and nuts—especially the nuts from the acuri and bocaiuva palms. Its strong beak can even crack coconuts. In captivity, they do well on a diet of fruit, vegetables, leafy greens and plenty of nuts, particularly the macadamia nut, as they require more carbohydrates than other parrot species. A pet hyacinth's diet can be supplemented with specially formulated species-specific pellets. Hyacinth macaws have a wingspan that can reach 4 feet, so they must be given adequate time to exercise and room for a good stretch. It is a good idea to give a hyacinth a minimum of one to two hours of time each day on a play gym or other safe area per day to maintain their muscles. These birds also need to chew to maintain their beak and jaws, so plenty of chewable toys are a must for these big beautiful birds. Large toys that can handle the beating of a powerful beak are good choices, as well as toys that have strips or pieces of leather incorporated into them. The bird's impressive beak evolved to crack open large nuts found, and it is instinctive for them to use it for shredding and chipping at hard objects. The key to good health with a hyacinth macaw is providing it with a diet that meets its special needs, along with regular health exams by an avian veterinarian.